FOR a team that has played second fiddle to Orlando Pirates in their recent Soweto derby encounters, Kaizer Chiefs have themselves to blame for having shared the spoils with their bitter Soweto rivals. 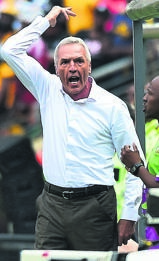 Amakhosi coach Ernst Middendorp did not beat about the bush after they let Buccaneers off the hook. But the manner in which his side defended towards the end of their drawn (1-1) Absa Premiership clash with Bucs has raised eyebrows. Chiefs are still waiting for their first derby win since their 2-0 victory over Pirates in December 2014, leaving Irvin Khoza’s side bragging rights with 12 unbeaten matches. The German mentor made defensive substitutions with the hope of protecting his team’s 1-0 goal advantage, a move that backfired as Bucs started penetrating their box where new goalkeeper Daniel Akpeyi was put at risk. Amakhosi defender Daniel Cardoso tucked away the opening goal from the penalty kick eight minutes into the second half. However, Bucs retaliated with Thembinkosi Lorch’s equaliser, 10 minutes before time. The draw might as well have written Chiefs off the title chase, leaving them with the Nedbank Cup as their only hope where they visit Eastern Cape side, The Magic FC at the Nelson Mandela Bay Stadium. Chiefs are fifth on the log table with 28 points, which is nine behind the log leaders Bidvest Wits, with 10 matches to go. “I’m disappointed with the results, but not with the performance,” said the German mentor. “We gave it our all but didn’t get what I thought we deserved,” Middendorp added. With Willard Katsande and Ramahlwe Mphahlele having started the match on the bench, which is something rare, Middendorp said “no one is guaranteed a place into the starting lineup”. “No one has the right to start the game over the others,” said Middendorp.